The authors of this paper measured concentrations of seven trace elements [arsenic (As), chromium (Cr), nickel (Ni), lead (Pb), copper (Cu), zinc (Zn), and cadmium (Cd)] in the eggshells of Rooks (Corvus frugilegus) as increased levels of these elements could be having a harmful effect, both individually or in combination, on the structural properties of the shell such as thinness or brittleness. Four of these elements are described as essential trace elements (Zn, Cr, Ni, and Cu) and three as nonessential ones (As, Pb, and Cd). The elements were selected due to previous findings of elevated levels, by the authors. The process by which levels of elements such as these increase in flora and fauna is called bioaccumulation. The effects seen may be due directly to one of the elements or as a result of an interaction between multiple elements and the levels of these in the Rook's environment will change according to the local land use: urban, industrial, or rural. The effects may also be linked to biochemical reactions between the elements and cellular Calcium during the birds production of eggshells. There is also a potential for the female Rooks to use eggshell production as a means of removing unwanted excess elements from their bodies. This study aimed to see if there was a relationship between the levels of each element, or combinations of elements, and whether this changed according to the land use - 'urbanisation gradient'. It is not simply that urban areas are the more polluted, in fact Rooks feeding in urban gardens are less likely to be in contact with certain elements that their rural cousins find on intensively farmed land. The eggshells were collected in the spring of 2005 in 43 rookeries ranging in size from 5 to 480 nests and located in various parts of Poland (Fig. 1). The eggshells were picked up from the ground beneath the nests. Rookeries were situated in three different types of built-up area that vary in their densities of buildings and human populations: villages, small towns, and large cities (>50,000 inhabitants). Element levels (parts per million) for each habitat is shown in the follow chart. Cadmium and Arsenic levels did not differ between eggshells from the three habitat types. However, the levels differed significantly between eggshells from rural (villages and small towns pooled) versus urban areas (large cities). 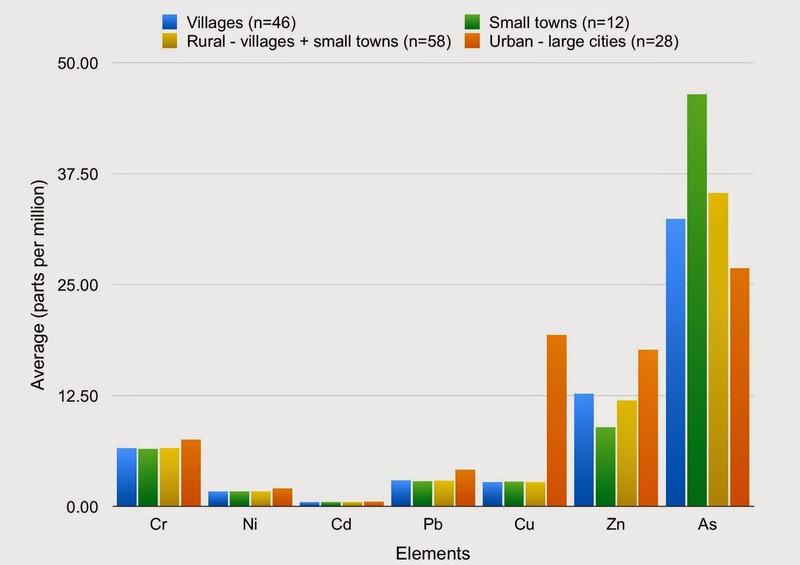 Chromium, Nickel, Lead, Copper, and Zinc levels were significantly greater in eggshells from large cities than from small towns and villages, which indicates a clear effect of the urban environment on the bioaccumulation of these elements. Concentrations of eggshell elements did not differ between small towns and villages, and only the Arsenic concentration was significantly greater in small towns than in large cities. Copper levels are much higher in urban areas but the potential effect of this is not discussed by the authors as this element is not thought to be significantly toxic and is required in many biological processes. The authors found a generally consistent positive relationship for six of the seven elements (Arsenic was the exception) across the four eggshell habitats suggesting parallel co-accumulation or co-precipitation in the eggshells. Chromium, Nickel and Cadmium levels are linked in rural areas. Copper, Zinc, and Lead levels are linked in rural areas. Chromium, Zinc, and Arsenic levels are linked in urban areas. Nickel and Cadmium levels are linked in urban areas. Nickel: sources of emissions into the ambient air are the combustion of oil for heat or power generation, Nickel mining and primary production, the incineration of waste and sewage sludge, steel manufacture, electroplating, and coal combustion. Cadmium: emissions are mainly due to non-ferrous metal production (Copper, Zinc, Cadmium), iron and steel production, incineration of refuse (cadmium pigments and stabilisers in plastics, nickel-cadmium batteries), and combustion of coal and oil. Arsenic is the fourth of the elements to show significant variation. Most of the man-made emissions of Arsenic are released from metal smelters and the combustion of fuels. The use of pesticides used to be an important source as well, but has declined since its restriction in various countries. Environmental release of these elements in the EU has dropped by a factor of ten over the last 40 years due to improvement in technology to control factory emissions. Chromium: emissions are largely related to ferrochrome production, ore refining, chemical processing, cement works, and car brakes and catalytic converters. With relatively small numbers of eggshells sampled and similarities in the element levels between sites the authors conclude that the hypothesised 'urbanisation gradient' that was expected to influence the levels of contaminants has not been proven to be true. It would seen that these contaminants are common across urban and rural areas due to airborne particulate travel and that female Rooks are incorporating them into eggshell by default (molecular interaction with Calcium), or by design (removal of unwanted elements from the body). The possible detrimental effect of these elements for the eggshell or chick are still to be discovered. The fact that these elements are incorporated together into the Rook eggshells does highlight important observations: monitoring eggshells across habitats can provide future clues to variation in the environmental levels of pollutants, and additional new contaminants may potentially be incorporated in parallel.